Orofacial trauma occurs when the face or mouth is injured from a bump, fall or other type of impact. Some incidents may appear more harmless than others. Regardless, looks can be deceiving, so it’s always a good idea to check that your child is stable. Essentially, you want to rule out any brain injury such as a concussion. If your child is presenting with any nausea, vomiting, loss of consciousness, unequal dilation of the eyes, or bruising at the base of the skull (at the back of the neck), you’ll want to make a visit to the emergency room immediately. Pointer #2: Stay calm and calm your child. You want your child to be settled down enough so you can take a decent look in his/her mouth. Is there blood? Where is it coming from - a cut lip, a cut gum, or a tooth? Determining the answer to that question will help a lot. To help stop the bleeding, have your child bite on a slightly moistened caffeinated tea bag. Pointer #3: Determine if it’s a primary tooth or permanent tooth that’s been affected. This sounds like an easy task, and depending on your child’s age, it may certainly be. For example, a 3 year-old would not yet have permanent dentition. For older children with mixed dentition (some primary and some permanent teeth), it may be harder to identify what’s what in a panic-stricken moment. Why is this important? There are different treatments/approaches for trauma to permanent teeth as compared to primary teeth. Pointer #4: Get peace of mind by contacting your child’s dentist. A pediatric dentist can evaluate the teeth with an exam and an x-ray (if necessary) and offer special coaching for home care to help prevent infection (see more below). Once you call, your dentist may not recommend an office visit, but give you instructions on what to do at home. Either way, you’ll be glad you called. Plus, having the trauma incident noted in your child’s chart will help your child’s dental team pay special attention to that area at future check-ups. If you’re dealing with an injured primary tooth, answer these questions: Is the tooth loose enough that you can tell? Has your child’s bite been affected from the trauma - is it normal or is there a tooth out of place (ex: either pushed back or partially out)? Should you discover that the tooth is out of place, it’s not a good idea to try to reposition the tooth. This is because the roots of the primary tooth can hit the crown of the permanent tooth bud underneath, causing damage to the permanent tooth. Instead, allow a pediatric dentist to take a look to determine the best treatment option. Chipped teeth are a common occurrence when it comes to orofacial trauma. You’ll want to look at the chipped tooth and make sure you do not see any pink in the middle area where the tooth was broken. This would indicate the nerve of the tooth is exposed. Not only can this cause a great deal of sensitivity/pain for your little one, but it would mean an immediate call to the dentist. Is the primary tooth knocked out? Once a baby tooth is avulsed (or knocked out), you want to keep it that way - never place the avulsed baby tooth back in the socket. Doing so could lead to possible damage/discoloration to the permanent tooth bud underneath. When your child’s permanent tooth is traumatized, it almost always calls for a trip to the dentist. Contact your child’s dentist as soon as possible for the best possible outcome. If you discover a permanent tooth has been pushed out of place, it can often be repositioned with a splint. Contact your pediatric dentist for an evaluation. 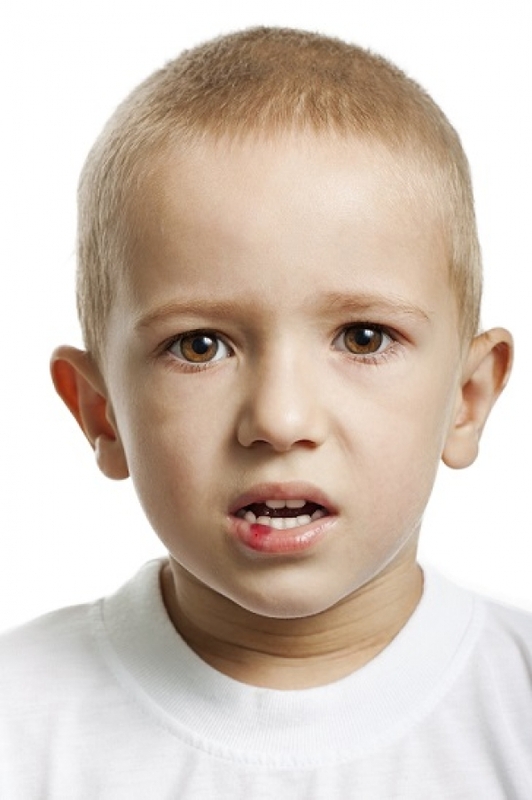 If your child chips a permanent tooth, try and locate the piece of tooth. If located, bring it with you to the dental office for assessment. Sometimes the dentist can rebond the piece of tooth. As in the case of a chipped primary tooth, make sure you do not see any pink in the middle area where the tooth was broken. This is indicative of a nerve exposure and would mean an immediate call to the dentist. Is the permanent tooth knocked out? If a permanent tooth is avulsed, place the tooth in milk and contact the dentist immediately. Time is of the essence, as the best chance for success occurs when the tooth is placed back in the socket within 30 minutes of coming out. If you’re unsure whether it is permanent or primary dentition, go ahead and place the tooth in a glass of milk. Depending on the scenario, it is not always possible to arrive at the dentist’s office in 30 minutes. In this case, immediately contact your pediatric dentist as they can guide you over the phone on how to properly place the tooth back in the socket or advise you further. After a tooth has been bumped, chipped, or otherwise traumatized, you’ll need to be extra careful with it to help prevent it from becoming infected. After trauma, the ligament that holds the tooth is loosened, giving bacteria a chance to travel up the side of the root and infect it from the inside. Reducing the number of bacteria in the area gives the tooth the best chance of staying healthy and allows the ligament to tighten back up to the tooth. How do you do this? 1. Great oral hygiene: Brush 3 to 4 times per day for the next 2 weeks. 2. Swish for 30-60 seconds with hydrogen peroxide mixed 50%-50% with water or prescription Peridex rinse after each brushing. If your child is too young to swish, swab affected teeth's gum lines (front and back) with a Q-tip dipped in the rinse. 3. Soft diet for 2 weeks: no biting into anything hard! Click here to download these instructions on caring for your child’s mouth following trauma. Electric Toothbrushes: To Buy or Not to Buy?